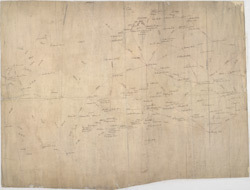 This rough triangulation diagram of southern England was draughted in the field to augment the angle and distance measurements recorded in the Ordnance Survey Field Books. Angular observations were made using a theodolite to measure the relative height of the land and plot individual topographical features. Triangulation points were usually at sites elevated above the surrounding landscape, often hilltops and church towers.